Not all Chinese schools in Malaysia use Mandarin as the medium of instruction. Surprised? Why are they called Chinese schools then? That is because the term “Chinese schools” has been used indiscriminately to group together disparate types of schools with a common historical background under a very wide umbrella. In reality, there are two broad categories for Chinese schools here: those that are private and those that are government-aided. Some of their key distinctions revolve around funding, medium of instruction and syllabus used. According to the Education Ministry, the self-funded Chinese independent high schools are private schools while those called national-type Chinese primary schools (SJKC) or national-type secondary schools (SMJK) are public schools that receive either full or partial financial assistance from the government. Chinese independent high schools may sound like an odd moniker but it can be traced back to the history of local Chinese-medium schools, which United Chinese School Committees’ Association of Malaysia (Dong Zong) chairman Datuk Vincent Lau told Malay Mail Online were first established by the migrants originating from China to provide education for their children. Surviving a push for English-medium schools during British colonial rule as they insisted on using their mother tongue for lessons, the Chinese-medium secondary schools that refused to switch to using Bahasa Malaysia in exchange for government funding became known as Chinese independent high schools. These schools do not receive funding from the federal government, except for one-off contributions. However, Dong Zong confirmed that state governments such as Penang, Sabah, Sarawak and Selangor do provide financial assistance. The respective school boards otherwise continue to rely on school fees and donations from the community for all expenses including teachers’ salaries and infrastructure. Dong Zong chairman Datuk Vincent Lau said the shrinking fresh intake of students is also tied to lack of space and the non-approval for new Chinese independent schools to cope with demand. There are also primary schools where Mandarin is used to teach all subjects. These existed before Malaysia was formed in 1963 and are now known as SJKC, where the vernacular language is allowed to continue to be used as the medium of instruction as an alternative to the Bahasa Malaysia-medium national primary schools (SK). SK schools are located on public land and accorded the status of “government schools” which the ministry fully maintains and funds. SJKC schools adopt the same national syllabus used by SK schools and offer the same school-leaving UPSR examination. But because they are built on private donated land, they are given the status of “government-aided schools” and receive less government funding compared to SK schools. While the Malaysia Education Blueprint 2013-2025 states that the ministry allocates teachers for both government and government-aided schools and fully pays for their salaries, funding in other aspects for these two subsets of public schools differ slightly. Both receive government support for operational expenditure in the form of grants-in-aid based on the same criteria of individual school’s needs, but there is a limit on funding for government-aided schools’ utilities bill. And while the government fully funds the development costs for SK schools, SJKC schools may get 80 per cent funding, sometimes more, for their renovation and construction. Similarly for SMJK schools which were once Chinese-medium schools that opted to conform by using BM and the national syllabus in return for government aid, the amount of government funding received also depends on ownership of school land. While SMJK schools have told Putrajaya that they should be granted full financial assistance regardless of their land status, they are currently only considered fully-aided schools if the school boards surrendered the land titles to the government. Otherwise they only receive partial financial assistance with teachers’ salaries and per capita grants paid by the government. SMJK students follow the same syllabus and sit for the same examinations as their counterparts in national secondary schools (SMK) during Form Three (PT3), Form Five (SPM) and Form Six (STPM). But SJMK schools also allocate more time for Mandarin classes with five periods per week to instil deeper awareness of the language and its roots among their majority ethnic Chinese students. In comparison, SMK schools offer only three periods of Mandarin classes a week. At Chinese independent schools, the syllabus and textbooks are prepared by Dong Zong, which also prepares and conducts the Unified Examination Certificate (UEC) for their students. While students typically sit for the UEC examination during their Junior Three and Senior Three years — or the equivalent of Form Three and Form Six in national schools — there are also some Chinese independent schools which offer the SPM to their students too though Lau said it is not compulsory for Chinese independent schools. 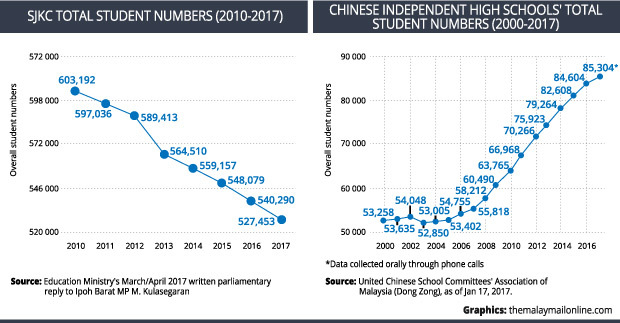 Dong Zong’s records showed that 8,574 students at the Chinese independent schools registered as SPM candidates last year. Lau said some Chinese independent school students may not take the UEC Senior Three exam after sitting for their SPM as a Senior Two student, opting instead for other pre-university courses. The STPM exam is not offered however, as the UEC Senior Three exam is its equivalent and is widely-accepted abroad and in local private institutions as a pre-university qualifier. The UEC examination for Junior Three is in Chinese for most schools, but some schools are also given examination papers in both Mandarin and English. UEC Senior Three candidates are given examination papers set in both Mandarin and English. While not part of Dong Zong’s tally of Chinese independent schools, Kuantan’s SM Chong Hwa has the unique arrangement of being a private secondary school where students can sit for both the UEC examination and examinations under the national syllabus. There are currently 81 SMJK, including three branch schools. The branch campus of Kajang’s SMJK Yu Hua, which received government approval last December after the 3,500-capacity main campus had to turn down students, will be the latest addition when completed. Based on Dong Zong’s data sourced from the Education Ministry, the number of SJKC schools has been shrinking while BM-medium national primary schools have been growing. As at last December, the number of SJKC schools numbered 1,298 compared to 1,346 in 1970. In contrast, SK schools boasted 5,877 in 2016 compared to 4,277 in 1970. The dwindling trend for vernacular schools is also reflected in the decreasing number of Tamil-language primary schools (SJKT) that recorded just 524 last year compared to 657 in 1970. As for secondary schools, there are currently 61 Chinese independent schools, inclusive of Johor’s Foon Yew High School and its branch which both collectively have over 10,000 students. Foon Yew is set to open yet another branch in 2021. But Lau of Dong Zong said demand remains high for enrolment in Chinese independent schools, especially in cities, where some of these schools have around 3,000 students and cannot take in more due to limited land, facilities and classrooms. “The other thing is we cannot get the permission to build more Chinese independent schools, the government does not allow, they limit you to 60. We applied but they don’t give permission,” he said, comparing this with the boom in the number of international schools approved by the government. As such, some Chinese independent schools have resorted to demolishing some of their buildings to rebuild additional storeys to cater to demand. While the overall number of students at Chinese independent schools continued its uninterrupted upward trend of 15 years and hit a historic peak this year with 85,304 students, it accounts for only four per cent of the total recorded number of secondary school students, which is 2,099,603 as of January 2017. SMJK schools account for over 108,000 students, and even when combined with Chinese independent schools amount to less than 10 per cent. The number of new intakes at Chinese independent schools has however been going down in the past four years. After a record high at 17,620 in 2013, this year saw only 14,481 enrolments, which Lau attributed to a cocktail of factors: the rural to urban migration, the subsequent imbalance between overcrowded urban schools and under-enrolled rural schools, and lower birth rates especially among the ethnic Chinese community. According to an Education Ministry parliamentary reply in the March-April session, the number of primary school students as of January 2017 is 2,674,327. A separate reply in the same session shows that the bulk of the student are enrolled in SK schools at 2,065,279, while almost one-fifth are in SJKC schools at 527,453 and SJKT schools account for 81,483. Based on the Department of Statistics Malaysia’s data of live births in the 2000-2015 period, the annual number of babies born in some of the preceding seven years before primary school enrolment from 2000 to 2017 are also among the lowest of the entire 15-year period. The SK, SJKC and SJKT overall student numbers have generally been on a downward trend during the 2010-2017 period (except for a rebound for SK schools in the past two years). Beyond the flocking of locals to international schools since the federal government removed limits in 2012 on intake of Malaysians, the Department Statistics Malaysia’s 2000-2015 data of live births may also give a hint on the explanation for the student numbers in national and national-type primary schools. Malaysians typically enter primary schools at age seven, so students freshly enrolled in the 2010-2017 batch would generally be those born during the 2003-2010 period. The annual number of babies born during the latter period are among the lowest in the 2000-2015 period — 481,800 in 2004, 474,473 in 2005, 472,698 in 2006, 479,647 in 2007. Dong Zong has long been pushing Putrajaya to recognise the UEC for entry into the civil service and local public universities, with Lau saying that further discussions are required to pursue this recognition. The government had in parliamentary replies said it is maintaining the status quo by letting the 60 Chinese independent schools here continue their operations as provided for under the Education Act 1996. The replies indicate that the government’s steadfast refusal to recognise the UEC is because of the differing national syllabus standards and alleged contradiction with the National Education Policy which envisions a uniform syllabus and examinations delivered in BM. The Higher Education Ministry had in a March 2016 parliamentary reply highlighted that it will deny public university entry to UEC graduates owing to several reasons including entry requirements of an SPM pass with credits in the BM subject; UEC’s BM levels not being on par with SPM standards; as well as alleged inadequate coverage of national history in the UEC syllabus. Lau said the BM levels may differ in the two examinations, adding that Dong Zong is agreeable to having UEC students sit for the Bahasa Malaysia subject under SPM as a single subject and would want to be able to waive sitting for the entire examination. “Maybe they have misconception about what we study, they are thinking we are studying Chinese history textbook from China or Taiwan, which is not true,” he said. He claimed that Chinese independent schools cover a wider scope in history lessons on Europe, China and South-east Asia compared to the syllabus taught in national schools, but that they also cover Malaysian history. The UEC is currently recognised by the Sarawak state government for entry into the state’s civil service and is recognised by local private universities such as the Selangor-owned Unisel, but is not accepted by the public universities such as Universiti Malaysia Sarawak which is under the federal government, Lau said. The Penang state government also accepts UEC graduates at its subsidiary companies. As for Chinese primary schools, Lau said the federal government should adopt a systematic policy by either relocating under-enrolled schools or build new schools in high-demand areas such as urban areas and new townships that have predominantly ethnic Chinese population. “Sometimes this becomes political, when it’s closer to election, the place there requests a school, the government [says] OK and they will build the school,” he said of the current ad-hoc approach. Chinese education groups had in two memoranda in 2011 and 2012 to the prime minister said an additional 45 SJKC schools in six states needs to be built. The government has yet to approve the construction of these schools as of a December 2016 statement by Dong Zong. Presently this year! I was done my school period and enlisted in online life experience degrees accredited program for my happy way of life. Since they have a simple approach to learn and surely understood instructors for showing all understudies. Understudies can basically get learning about courses and advances. Students need to enlist in it to develop in their future or build up his/her profession quick.